While the expectation in Philadelphia is for them to push for the playoffs this season, TSN’s Bob McKenzie notes in the latest TSN Insider Trading (video link) that their plan isn’t to start trading away high draft picks or top prospects to get the short-term help to put them over the hump. Instead, he reports that the two items on new Flyers GM Chuck Fletcher’s list are to look for an upgrade between the pipes and evaluate head coach Dave Hakstol to see if he should have a long-term future with the team still. Goaltending has been an issue for Philly all season long and for quite a few years before this one. Brian Elliott has been passable but has had injury troubles while veteran backup Michal Neuvirth has battled numerous injuries. Veteran Calvin Pickard struggled and is now gone after being waived so Anthony Stolarz is currently up in a number two role. None of these players project to be long-term starters for the team so it wouldn’t be surprising to see the Flyers target someone who can serve as a reliable starter for a couple of years and serve as a bridge to top prospect Carter Hart. While the Islanders would like to bring top goalie prospect Ilya Sorokin to North America as soon as possible, it doesn’t appear that his KHL team is open to letting him go. Igor Eronko of Sport-Express (Twitter link) spoke with Sorokin’s agent who indicated that CSKA Moscow has no intention of letting him go until the expiration of his current contract in 2020. The 23-year-old is once again one of the top goalies in the KHL, posting a stellar 1.19 GAA with a .941 SV% through 22 games but it appears he’ll have to wait a while yet to join the Islanders, even if he’d like to come over after this season as Arthur Staple of The Athletic reported (subscription required) earlier today. The Rangers appear to be set to get some help up front in time for Saturday’s game against Florida. Newsday’s Colin Stephenson reports that wingers Pavel Buchnevich, Vladislav Namestnikov, and Mats Zuccarello could all play in that game. Buchnevich has missed the better part of a month due to a broken thumb, Namestnikov has missed three straight with a concussion, while Zuccarello has played just twice in the last month due to recurring groin issues. The New York Rangers are trying to use this season as a development year, giving young players lots of ice time to see what they can do. Unfortunately, one of those young players is going to lose a huge chunk of the season to injury, as the team announced Pavel Buchnevich will be out for four to six weeks after breaking his thumb this weekend. 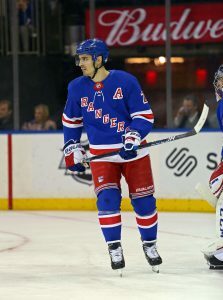 Buchnevich, 23, is coming off an impressive season which showed he could be a key player for the Rangers going forward. With 14 goals and 43 points in 2017-18, he actually finished fourth on the team in scoring and set himself up for a pretty substantial raise at the end of his entry-level contract. That was dependent on him taking another step forward this season, but it looked like he had early on as Buchnevich already has nine points in 14 games. Unfortunately that 43 point total now seems in doubt given he’ll miss up to 18 games with this latest injury. The Rangers are off to a better start than many expected, as their 8-7-2 record has them tied for third in the Metropolitan Division. That’s in part thanks to Buchnevich’s strong play to start the year, something they’ll have to find a replacement for now that he’s sidelined. An increased opportunity may present itself for some of the Rangers other prized young players like Lias Andersson and Filip Chytil, something they’ll have to take advantage of quickly if the team has any hope of competing for the playoffs this year. The New York Rangers have made a few changes, but so far remain quiet this offseason as the real changes the team has made has been in their coaching staff. From new head coach David Quinn to assistant coaches Greg Brown and David Oliver, the team expects many of the changes to be within the organization as new coaches mean using players in different ways, which could see several players see big improvements. Shayna Goldman of The Athletic (subscription required) breaks down some of the changes the coaching staff intends to implement this season and suggests the team could get boosts in performance from multiple players, targeting Kevin Hayes, Pavel Buchnevich, Brady Skjei and Kevin Shattenkirk. Assuming Hayes isn’t traded this offseason as has been rumored, the team could see him take another step in his development. Shifted into a shutdown role more recently, Hayes has been successful, but he has the skills to be a top offensive forward if needed, which could happen this season. Buchnevich is another offensive force who has been slowed by injuries, while the team has high expectations for Skjei and Shattenkirk (finally healthy) to return to form as top-four defenders. The Athletic’s Josh Yohe (subscription required) explains the reasoning behind the Pittsburgh Penguins’ recent signing of center Derek Grant. While there has been recent talk about the excessive amount of centers the team has, there have been even more after the team added Grant. Yet, Yohe writes that the Penguins feel the team needs as many centers as they can find for depth purposes and that Grant could find himself playing either center or wing, depending on how training camp shakes out. However, the possibility the team might still make a late offseason trade remains a legitimate possibility, suggesting that Derick Brassard could be moved still. The Athletic’s Nick Kelly (subscription required) writes that Pittsburgh Penguins Jake Guentzel is enjoying his offseason this year, while playing in Da Beauty League, because he got some extra time off when the Penguins were eliminated in the second round of the playoffs this past year. While he has no wish to get that extra time off again, Guentzel has spent his time this offseason in the weight room in hopes of becoming a more well-rounded player. He hopes to take his game to the next level after a full season in which he tallied 22 goals and 48 points last year. However, he scored just two goals in his final 20 games, suggesting he needs to work on his strength and conditioning to take that next step. Newsday’s Andrew Gross writes that the New York Islanders Joshua Ho-Sang should get a clean slate with a new coaching staff and management coming into the fold. Ho-Sang is expected to take on a full-time roll with the organization this year after he spent most of last season in the AHL due to issues with Ho-Sang’s attitude. The 22-year-old criticized management about how they were handling their development. He started the season in New York, posting solid numbers, including two goals and 12 points in 22 games, but was sent down to the Bridgeport Sound Tigers to work on other parts of his game and played 50 games there, but struggled at times, finishing with just eight goals. Hours after putting up an egg in their 5-0 loss to the Philadelphia Flyers on Saturday, the New York Rangers fired their head coach Alain Vigneault after five years. After four playoff appearances, the Rangers struggled, finishing 34-39-9 on the season. In all, however, Vigneault had quite a bit of success in his time in New York, which included taking the Rangers to the Stanley Cup Finals in 2013-14, his first season with the team. He led the team to a 226-147-37 record over the five years. The firing also came after Vigneault himself stated in his post-game press conference that he deserved to stay and defended his record, according to Newsday’s Colin Stephenson. Some of Vigneault’s struggles were not his doing as the Rangers decided to rebuild on the fly, sending out a letter on Feb. 7, telling fans about their decision to rebuild the team. The Rangers followed that by selling off several veterans including Michael Grabner, Rick Nash, Nick Holden, J.T. Miller and captain Ryan McDonah. However, Stephenson also points out several issues that came up this season that forced the Rangers to head in that direction. After re-designing its defense with the acquisitions of star free agent Kevin Shattenkirk and re-signing Brendan Smith, the team was hoping to possess one of the best defenses in the league. Instead, the team started slowly at 1-6-2 in its first nine games and was 3-7-2 after 12 in which Vigneault almost lost his job. The team was able to right the ship after that, but only because of the impressive play of both the team’s goaltenders in Henrik Lundqvist and Ondrej Pavelec. Neither goalie was able to sustain their great play. Injuries also played a part. Shattenkirk was playing hurt, while Smith came into camp out of shape and never returned to form before eventually being sent down to the AHL. Winger Chris Kreider missed 24 games due to a blood clot that led to surgery on his ribs. Center Mika Zibanejad missed nine games with a concussion, while Shattenkirk had knee surgery in January and never came back. The Athletic’s Rick Carpiniello writes (subscription required) that there were other reasons as well that stand out when it came to Vigneault. The coach’s lack of success at the blueline have been issues for years as his system had failed repeatedly. Vigneault had undergone three different defensive assistant coaches in three years, including Ulf Samuelsson, Jeff Beukeboom and Lindy Ruff and replaced most of the defense and still failed to get them going. His tough love was also an issue as he butted heads with many players, especially Miller and Pavel Buchnevich. However, the most telling numbers is the team’s record from Jan. 7 to Feb. 25, when Vigneault led the team to just a 5-16-1 record. Vigneault has a 648-435-98 overall record throughout his career with the Montreal Canadiens, Vancouver Canucks and the Rangers. He won the Jack Adams Award as Coach of the Year in 2007. TSN’s Bob McKenzie was the first to report the news. The Flyers turned down a trade proposal from the Red Wings that saw Detroit request a third-round pick in exchange for goaltender Petr Mrazek, reports Helene St. James of the Detroit Free Press. This comes on the heels of Philadelphia losing Brian Elliott for more than a month which has them going with a current tandem of Michal Neuvirth and Alex Lyon between the pipes. As a result, many have expected Philly to add another netminder at some point before the February 26th trade deadline but it appears GM Ron Hextall isn’t prepared to do so just yet or has more of a depth goalie in mind. It’s a case of good news and bad news on the injury front for the Rangers. Larry Brooks of the New York Post notes that winger Pavel Buchnevich will return to New York’s lineup tonight against the Senators after missing the past seven games with a concussion. However, center Kevin Hayes is unlikely to play due to a lower-body issue that has been lingering since the All-Star Break. The Canucks continue to receive trade interest in defenseman Ben Hutton, Rick Dhaliwal of News 1130 reports (Twitter link). The blueliner has been a frequent healthy scratch of late and has another year left on his contract after this one at a $2.8MM cap hit which is a bit pricey for someone who is on the outside looking in at playing time. In a separate tweet, Dhaliwal adds that Vancouver has inquired about the asking price for Coyotes center Max Domi and winger Tobias Rieder but notes that the price is quite high. Vegas has been keeping tabs on the Sabres lately, notes Mike Harrington of the Buffalo News. David Conte, special advisor for hockey operations for the Golden Knights, has attended multiple Buffalo games over the past week while also watching their AHL affiliate in Rochester. While they are probably not a likely suitor for winger Evander Kane, they could be interested in adding some of Buffalo’s depth players in an effort to shore up their roster before the deadline.